(English) See why kayaking is the best way to get inside the most beautiful sea cave in the world, the Benagil cave, here in the golden coast of the Algarve. Also, have you ever tried SUP? Leider ist der Eintrag nur auf Amerikanisches Englisch und Europäisches Portugiesisch verfügbar. For the sake of viewer convenience, the content is shown below in the default language of this site. Sie können einen Link anklicken, um zu einer anderen verfügbaren Sprache zu wechseln. 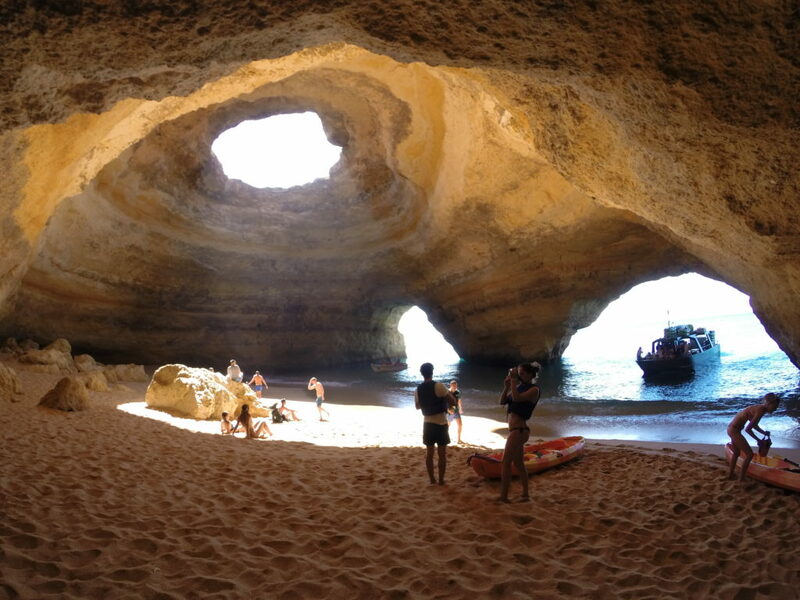 The most famous attraction in the Algarve right now is the great Benagil cave. One of the biggest sea caves in Europe, with an open top and a real beach inside. Certainly one of the most exotic places in the world, and only accessible by the sea! After searching a lot for the best way to get inside the cave and relax on the sand, we discovered that the best way to go inside the Benagil cave is by kayak! 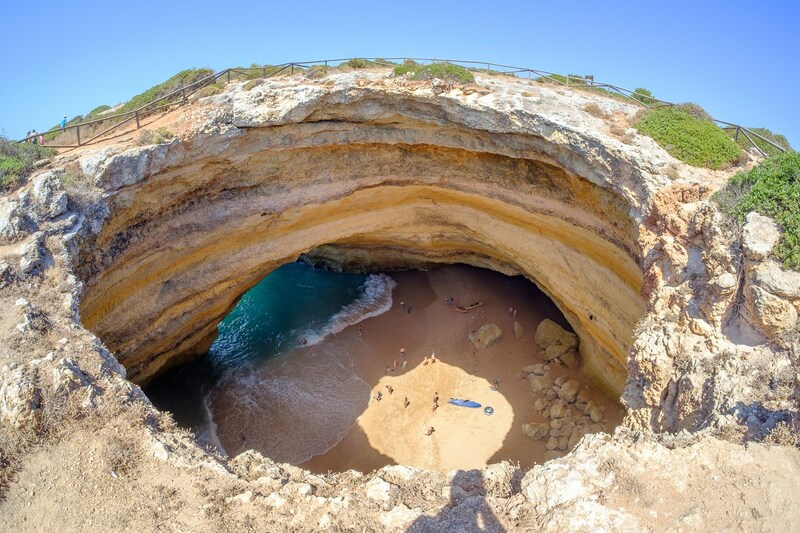 The Benagil cave has two openings to the sea, and a hole in the top, and you can walk over it by land. Where is the Benagil cave located? In the sunny Algarve, south of Portugal and home of the hottest summer destinations in Europe, is the small and charming village of Benagil. For many years it was known as a simple fishermen’s village, with a nice proximity to the most beautiful beaches. Next to the Benagil beach, there is a marine cave that only a few locals knew, that now is the most famous secret of Europe. The Benagil sea cave was considered one of the most incredible sea caves in the world by The Huffington Post in 2017. Why is kayaking the best way to visit the Benagil cave? As we have already pointed out, the only way one can get inside the Benagil cave is by the sea. Since it is close to the beach, many people think it would be okay to swim there unaccompanied. Don’t swim from the beach to the Benagil cave! Since this place is very in now, and specially during the high season there is a lot of boat traffic in the entrances of the cave. Yes, you read it right. It is not safe to swim among the boats, and people have been seriously hurt by doing that. The boats aren’t allowed to stop inside the cave anymore! Sure you could take a boat tour and visit the many caves in the Algarve, but for the safety of the bathers and the passengers, these boats are no longer allowed to stop in the sand. So unfortunately you can’t get off the boat inside the cave. Kayaking inside the Benagil cave! Kayaking itself is a very fun and fulfilling activity, and the Algarve has the most amazing spots to practice kayak. Near Lagos in Ponta da Piedade, and going inside the sea caves of the golden coast, like the Benagil cave. We know a kayak tour that takes you inside the Benagil cave starting near Carvoeiro. You get on the kayaks there, and follow your guide to the caves in the Algarve coast. The tour starts on the Centeanes beach and is about 30€, and takes you along the coast heading east to the Benagil cave. The starting point is close to Benagil, and the coast is so beautiful that you exercise with total happiness. It takes around 2 hours to go and come back, plus a time to swim in the sea and relax. And don’t worry, in the journey back you’ll be pulled by the support boat so you can rest. The kayak and SUP tour starts in Albufeira and will take you to the area of Benagil on board of a modern catamaran. Another option starts in Albufeira, and is a bit easier. You’ll embark on a catamaran in the Marina of Albufeira and be taken closer to the Benagil cave. It’s a 4-hour guided kayak and SUP tour for only 42€ , but really our favorite choice. There is full support on and off the catamaran, toilets, bar on board and a really professional crew. If you just want to enjoy the catamaran tour, viewers are accepted too! It’s a safe and fun trip for all types of travelers. Or if you are staying nearer Portimão, there’s also a kayak + boat tour with great reviews for 65€ that starts in Ferragudo. Once Ferragudo is far from Benagil, the tour starts a motor boat taking you and the kayaks nearer Benagil, where you get on the kayak. Here you get to see more of the Algarve coastline and caves, and relax on the boat as well. Besides the Benagil cave, your guide will also show you paradisaical beaches, sea caves along the entire coast and the most beautiful rock formations. The golden coast with the sea of emerald really is a wonderful landscape. Kayaking there is a privilege, and when you get to the Benagil cave you understand why. It is a enormous cave, created naturally and so secluded that many locals didn’t even know it existed! Stand Up Paddle is just as awesome! SUP is very popular now, and a bit easier than kayak. For those who don’t love kayaking so much, here’s a perfect alternative: Stand Up Paddle! SUP or Stand Up Paddle tour will also take you inside the caves and are so much fun! The guide is very nice and experienced plus the reviews are always excellent. You can start a SUP tour from the Benagil beach for 55€ and follow the leader inside the cave. You can be 100% sure that you’ll have a great time with this tour! “We loved being able to navigate the smaller caves that many of the boats could not enter. The major bonus is that you get to exit the kayak at Benagil, while the boats come in and go out very quickly. 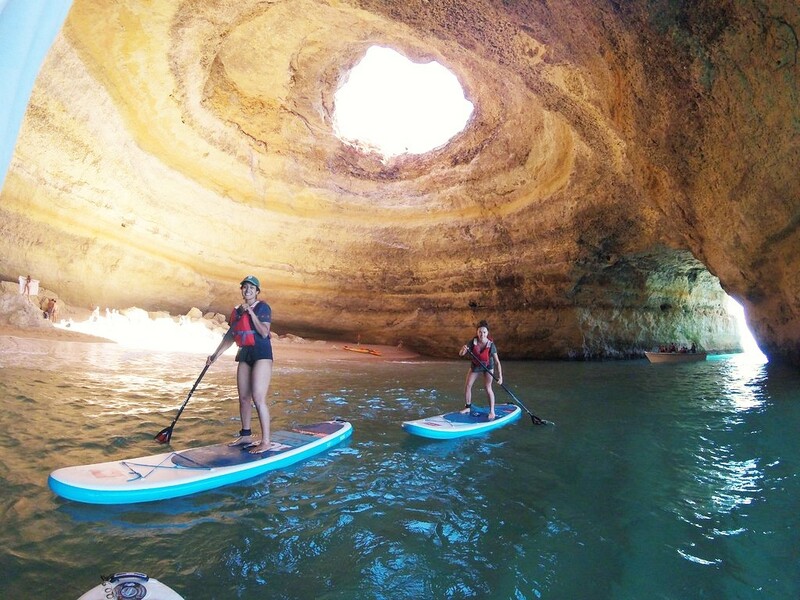 I absolutely recommend doing it this way.” – Danielle Marks, kayaked to the Benagil cave from Carvoeiro. algarvebenagilkayakportugalsup Post written by Letícia Melo. Olá Alice, obrigada pela pergunta! Nos passeios que saem de Albufeira e do Ferragudo você pode deixar seus pertences no barco de apoio enquanto faz o passeio. No passeio que sai da praia de Centeanes você usará um kayak que possui um compartimento para guardar seus pertences em segurança. Caso seus pertences sejam muito grandes, sempre há a possibilidade de deixá-los no ponto de partida com a empresa em terra.